Page 4 - KaBOOM! News | KaBOOM! Not all problems are hard to solve. In Detroit, one of the most formidable barriers to play is overgrown grass. Enter Tom Nardone (pictured right), a do-gooder but no goodie-goodie. 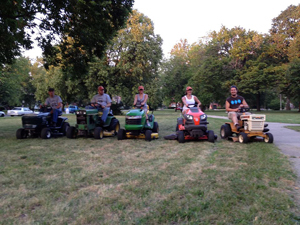 Founder and Gang Leader of the Detroit Mower Gang, Tom and his motley crew of “renegade landscapers” are taking action. Rather than wring their hands, they realized that they have the tools they need—namely, mowers, trimmers, lawn tractors, and muscles—to transform Detroit’s deteriorating parks. 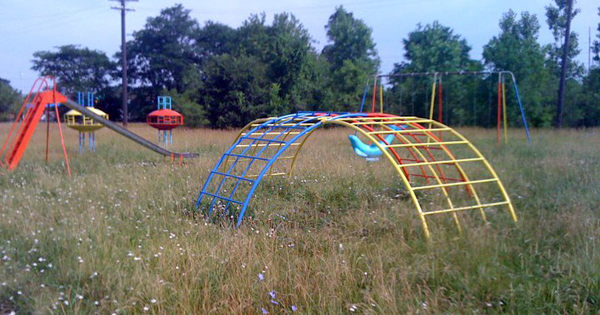 After all, no one wants to visit a playground if they have to wade through grass to get to the swings. An abandoned playground becomes vulnerable to vandalism and crime, launching a vicious cycle that can change the entire character of a neighborhood. 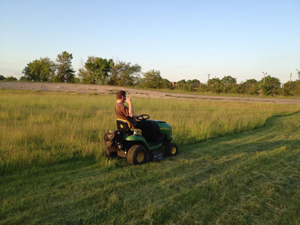 Tom, a father of three, started the Mower Gang in 2010, shortly after Mayor Dave Bing proposed closing 77 city parks, leaving thousands of kids without a place to play. At the time, Tom was coaching one of his son’s soccer teams, but he wanted to give more back to the community. “I have to do something that fits me,” he thought. 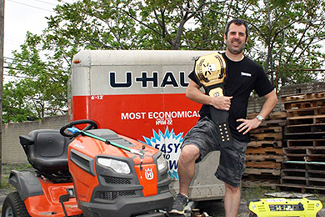 From its humble beginnings, the Mower Gang has steadily grown—and its work doesn’t stop at mowing. The gang meets every other week at a different park, usually attracting about 20 volunteers. In 2011, they held a “road rally,” which included a scavenger hunt to collect information about 90 of Detroit’s parks and determine areas of need. Realizing that many playgrounds in Detroit had swing sets, but no swings, the Mower Gang began a project on Kickstarter to replace 40 of the city’s 200+ missing swings. They aimed to raise a modest $800 and ended up with $3,020. The Gang also received a Let’s Play Maintenance grant from KaBOOM! to help purchase new playground surfacing. This past Memorial Day weekend, 70 weed-whacking, grass-hacking volunteers gathered to tackle 12 parks in 24 hours as part of the first annual Mowtown Mowdown. “People love a good deed and nobody spends the night in a Detroit park. We were just crazy enough to do both,” Tom says. And that something can mean quite a lot for a child. 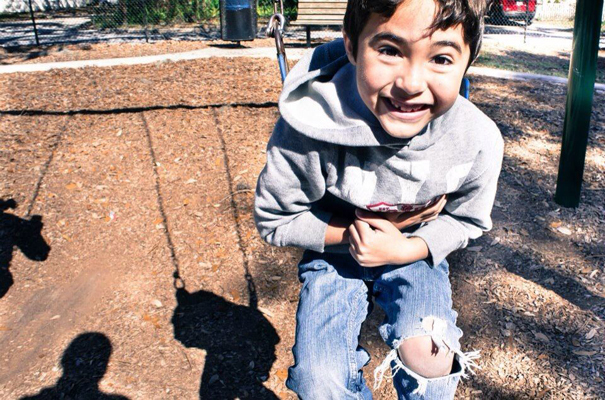 "The park is one of the bright moments in childhood," Mower Gang member Andy Didorosi says. "You learn there, you play there, that’s your jam. And if your park is dangerous, overgrown or unusable, well ..."
Photos via the Detroit Mower Gang's Facebook page. We know what they say about all work and no play. That's why at KaBOOM!, we make an effort to take some time out to recharge. After all, adults need recess too. We recently took a field trip to The National Building Museum to experience three of its current exhibits: The Building Zone, PLAY WORK BUILD, and Detroit Disassembled. The first two exhibits helped us see the KaBOOM! ideals of play in action. Detroit Disassembled provided a stark counterpoint -- a reminder of the many places in our country where children lack access to a safe place to play. In The Building Zone (top left), we noted that once you opened the gate, you crossed into a "land of play," moving from observing to doing. "You couldn’t fit one more child in the sandbox," one Boomer noted. 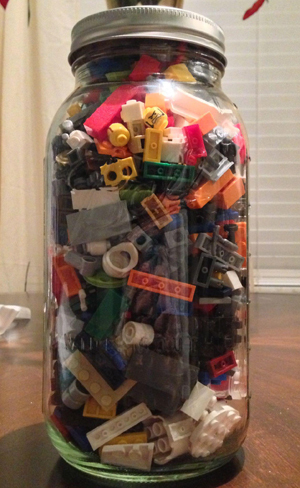 "It was so full of play!" Another noted: "My group was amazed by the number of families playing together. In one case we even saw a grandmother, mother and child! I think this really speaks to the level of engagement the exhibits lend themselves to." Moving upstairs to PLAY WORK BUILD, we noticed how the Imagination Playground blocks gave children free reign over how they played. The exhibit provided all the tools necessary to stimulate creative play for children -- and adults. Boomers noticed how the blue blocks, both small and large, "really got parents building too!" 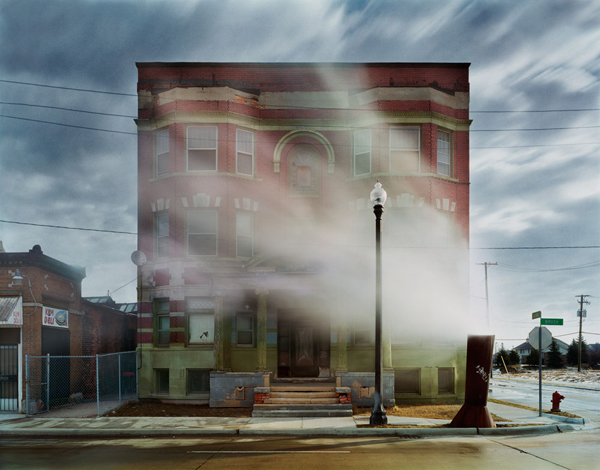 An image from Detroit Disassembled. Photo by Andrew Moore, from the collection of Fred and Laura Ruth Bidwell, courtesy of The National Building Musuem. After so much play, it was time for reflection. The Detroit Disassembled exhibit served as a poignant reminder that play is not everywhere. We all agreed that we must continue to "come together in places where situations are difficult and let resilience and team champions shine through." We need to shift the mindset to see potential, not destruction. 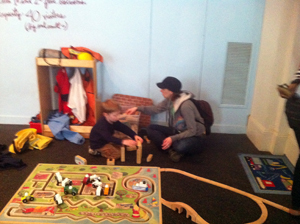 During several of our interactions, Boomers noted how parents brought their kids to National Building Musuem consciously because they recognize that their kids "need time to play." Grateful to work at an organization that understands this need also extends to adults, we returned to the office reinvigorated to carry on our mission to give children everywhere the childhood they deserve. Update 8/29: When we last checked in with Ed Barker in April, he had recently completed his 50th playground build with KaBOOM!, but Ed certainly wasn’t satisfied with reaching the half-century mark. In only a few months, he added 10 builds to his tally and has now participated in an incredible 60 KaBOOM! playground builds! Ed’s unwavering passion and determination to help give kids the childhood they deserve by bringing play to those who need it most also resulted in another milestone: the Points of Light Institute recognized his incredible commitment by naming Ed as the Daily Points of Light Award honoree on Aug. 29. Ed impressed the team at Points of Light so much that they even wrote this feature story about him! Keep up the great work, Ed! We always say that volunteering on a KaBOOM! playground build is a “feel-good” experience, and for Ed Barker (at right), that feeling has lasted not just for six hours, but for over six years. A self-described “KaBOOM! 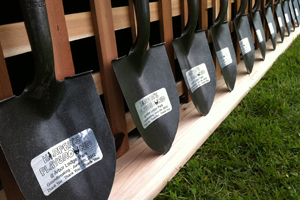 volunteer addict,” Ed recently participated in his 50th playground build. 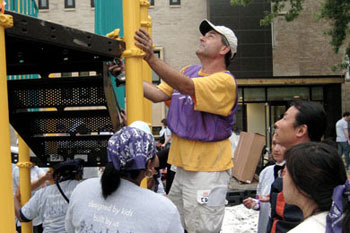 He has worked alongside more than 10,000 volunteers, bringing play to 27,500 children in need. My real job is for Fannie Mae. I’m a Senior Account Manager – I visit banks, mortgage companies, and credit unions and buy up their loan portfolios. Fannie in turn will securitize all the collective purchases so they can provide capital for more home loans. It’s a circular community reinvestment, so we can put as many people in homes as possible. That’s actually what attracted me most to the playground builds. What I do day to day, I visit the banks, visit the people in suits just like me, but I never get to see the smiles on the borrower’s faces as they sign the loan documents, or when the bank hands them the keys. I do get to see that on the playground. The fulfillment piece comes at the very end, when you’re with the people you worked side by side with all day long. You see the smiles on their faces as they see what was accomplished and I especially enjoy the joy on the kids’ faces when they see their new playground. It sounds kind of corny, but it really is cool and validates all the hard work. There are other benefits, too. I can’t tell you the number of times when I see people who are neighbors but who have never met one another, and who are friends by the end of the day. Really, it’s the playground creating a community rather than the community creating a playground. The build that sticks out most in my memory is actually the first build I participated in. Fannie Mae was sponsoring five builds in one day in New Orleans the year after Katrina hit. Fannie put their sales meeting down in New Orleans so they could have half the company on site to build playgrounds. I did work hard, but I had a blast too. The mulch pile must have been two stories high, and there was ridiculous humidity and heat, but I was up there dancing, having a great time. We even got done a half hour early! At the end of the day, the kids were there and I was collecting up tools wearing my silly Build Day hat, and one kids said, “I like your hat.” I said, “You can have it,” and he took out a coin that he had gotten from a Mardi Gras parade float and he said, “Then I want you to have this.” It meant a lot to him to carry it around in his pocket and yet he gave it to me. It meant that much to me that he appreciated my effort that I still carry that coin around with me to this day. I caught a bug on my first build. I wanted to have that feeling more often. Since then, I’ve been constantly seeking out if I can build a playground during business travel, or use my vacation time; it’s that fulfilling. I also get free T-shirts and hot dogs, so there are some side benefits, I can’t complain! It’s all about making the world a little better, one playground at a time. I’ve been able influence others – not only coworkers, but some friends, my neighbors, even my family. I help out on Prep Day too, before the build, and they always want to know, “Why would you want to spend 10 hours one day digging holes, coming home covered in mud and stinking and then go right back out the next day?” But once I bring them to a build, they get it. With each one of these builds, I’ve made at least one really good friend that I stay in touch with. I’m not great on social media but I’m good at picking up the phone and calling people. There are at least 30 people I keep in touch with, and I’ve gone back to some of the towns I’ve volunteered in to visit with them. The last build I participated in, my 50th, was in one of the most dangerous neighborhoods of Chicago, with one of the highest per capita murder rates in the country. It made me think, “Why are teenagers shooting each other? How did it get like this?” It all starts at the childhood stage. They lost trust in their family, their neighbors, and their community. So you have to rebuild that trust and show them people care. The playground is just a piece of that. As a volunteer, it gives you a good feeling when you drive past a playground and see kids and families. You see a mom sitting on a bench you helped build that wasn’t there before. It makes you feel good all over again. Being a volunteer is also about rebuilding yourself – find your passion, find what drives you most to benefit others and throw your whole self into it. When I look back on all the projects I have helped complete, I loved them all. But I am more excited about the ones I have yet to complete. If every community had a "Play Lady" like Pat Rumbaugh, a lot more kids would be getting the daily active play they need. But at the very least, every community can now get a copy of her upcoming book. 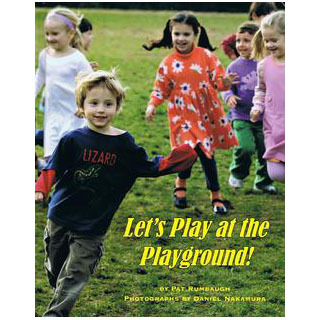 Let's Play at the Playground is an early reader that will inspire kids and adults alike to go out and play. 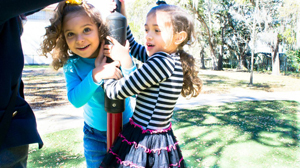 As Dr. Stuart L. Brown, Founder and President of The National Institute for Play, puts it, "This joyously pictorial panorama of playground play lifts one's spirit. Its compelling pictures capture the joy of spontaneous play, and evokes the momentum for a lifetime of healthy play, sharing and cooperation." Pat Rumbaugh, a former physical education teacher, lives in Takoma Park, Md. In March 2009, she founded Takoma Plays, an organization dedicated to promoting play and planning free play events for the community. Thanks to Pat's tireless efforts, KaBOOM! has named Takoma Park a Playful City USA community for four years running. Let's Play at the Playground is photographed by Daniel Nakamura, a Maryland dad, play advocate, and owner of Booth-o-Rama Photobooths. Pat and Daniel are joining forces to extend the impact of their book by co-founding Let's Play America, an organization that aims to encourage and facilitate efforts like Takoma Plays in cities and towns across the country. Ready to play? Reserve your autographed copy of Let's Play at the Playground today! Harper Rose Goldberg is the most amazing little girl you’ll ever meet. I’m biased as her dad, but it’s true. At birth she had a small cyst deep in her throat that was blocking more than 70 percent of her airway. She fought for hours to cling to her life while the doctors worked to get an air tube past the blockage. They eventually diagnosed her with Emanuel syndrome, which explained some other complications and which had her in the hospital for two months. With less than 200 known cases in the world, the doctors knew very little about the syndrome. They told us, “You should expect her to never walk nor talk in her lifetime.” She took her first independent steps at age five. Still, her mobility remains limited and she often uses a walker to get around. Harper, left, poses in front of her playground construction site with her family. When Harper was four, my wife and I were at our neighborhood park and realized that her choices were pretty limited. We approached the Portland Parks & Recreation department and asked if they would consider building an inclusive playground. They said they didn’t have the budget, but if we could fundraise, they would help facilitate the project. One of our main motivators was to help Harper get to know her neighbors. We were becoming increasingly frustrated with the status quo of the “disability world” – particularly after we experienced the exclusion of Harper from our neighborhood school. We were forced to enroll her in a school all the way across town. After that happened, it fueled our fire to get this playground built. When we approached our local neighborhood association (Arbor Lodge) and asked for an endorsement, they not only endorsed the project but also wanted to make it a priority for the neighborhood. That gave us a lot of faith that we were actually going to do it. The project took a major 180 degree turn in March 2011 when we visited with a design firm called MIG, Inc. They hosted a design charette along with Girvin Associates, Inc. and members of the Portland Parks Department. The research that MIG, Inc. presented about how design impacts a playground, how children interact with space, and how a properly designed space can encourage collaborative play and cognitive development—it completely blew my mind. Lots of people think that playgrounds are important because they help kids move their legs around and get their bodies moving, but it goes so much deeper. The design that came out of that meeting was so inspirational, so beautiful, and so paradigm-shifting, I think it helped us attract more major donors. They say to catch bigger fish, use a bigger lure. People were inspired to be part of something that was not only about accessibility but also about better design. For example, many inclusive playgrounds use ramps that lead to a structure, but that limits the choices that kids on wheels get to make. Why not eliminate the structure and create a plaza instead? We began to understand how a more open-ended design and a more natural environment would encourage kids of all abilities to use their imaginations more. Construction on Harper's Playground begins. The resulting drawing, which was done by my childhood pal, Todd Girvin, helped us not only secure donors, but also a pro-bono developer, Gerding Edlen; a contractor, Walsh Construction; and an all-important pro-bono landscape design firm to take the concept drawing into construction document phase, PLACE studio. The savings to the project represented by all of these generous firms equals approximately $300,000. I like to call the fundraising and planning process a modern-day stone soup in action. I’ve always loved that story. We started with nothing, but we had to convince everyone that even if all they had was one carrot, that carrot would help. I had so much passion for the concept, I couldn’t stop talking about it. Everyone I spoke to about the why and the what, I had a new believer who was ready to help. We were adopted by The Timbers Army, the local supporters group of our Major League Soccer team. They raised just shy of $85,000 for the project. We also received a $75,000 grant from a foundation that happened to be run by a couple we were seated next to at a wedding. 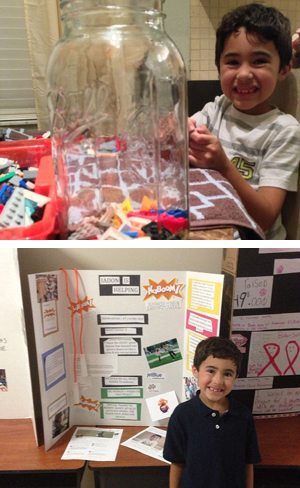 There were donations that came in from neighborhood kids who had set-up lemonade stands on our behalf. It was truly a humbling experience. In the end, the total project value was $1.2 million dollars. 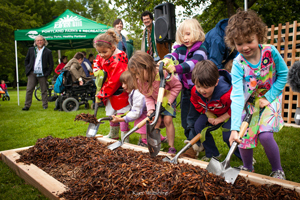 Neighborhood children break ground at Harper's Playground. Now, three years later, we have this awesome “soup” in the middle of our community, and everyone threw some ingredients into it. I go at least three times a day—and of course, Harper is a celebrity there. It’s very difficult to find the words for how gratifying it is to see the playground in action. It was something I was dreaming about for three years. I would close my eyes and imagine it, and it’s actually how I imagined. Because of the new paradigm we established, there’s a broader range of age groups. Neighbors say that children at this new playground play more often and longer. And kids are seeing examples of inclusion that could expand into schools and in the workplace. 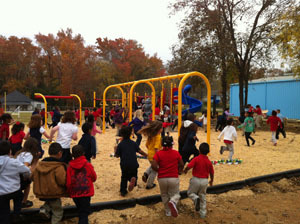 Families flock to the completed playground. We hope this project will serve as a Trojan horse for the inclusion concept. We are working on a vision plan for expansion within Portland and beyond—the sky is the limit in terms of the models we could approach. Harper’s Playground is just the beginning. Photos courtesy of Cody Goldberg and Kyer Wiltshire. 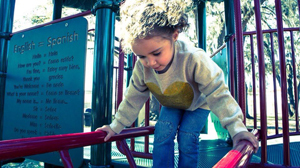 Does access to a playground make for happier, healthier kids? By the end of 2013, Health Care Service Corporation (HCSC) and its Blue Cross and Blue Shield plans in Illinois, New Mexico, Oklahoma and Texas will have built 39 playgrounds through a partnership with KaBOOM!. The company's support for KaBOOM! is part of its Healthy Kids, Healthy Families program, a three-year initiative designed to improve the health and wellness of at least one million children through community investments. The study, conducted in 9 cities in 2011, used a learning community model to examine how being part of the KaBOOM! playground building process affects attitudes about the health promotion impact of physical activity and play, and the potential ripple effects associated with the community building aspects of the projects. Parents and other adults involved in children’s well-being almost universally agree that play is strongly associated with better health for kids. They were aware of this before they started, and this knowledge contributed to their desire to build a playground. 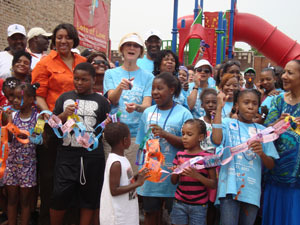 90% of adults believe kids in their community want to play more following the playground build. 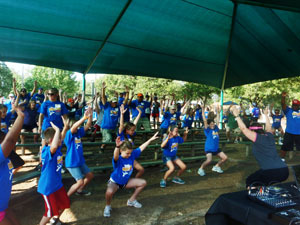 96% of adults believe kids in their community are getting more exercise following the playground build. Between 83% and 94% of adults believe that the playground has increased opportunities for higher quality play, including more fun (94%), more creative and challenging play (88% each), and more prospects for skill mastery (83%). The percentage of adults saying kids are “bored” when they are outdoors dropped from 71% to 25% following the playground build. There was an 11% increase the number of adults who said they played outside with kids at least three times a week between the pre- and post-build surveys; among parents the increase was even higher, with a 16% increase in the number indicating they went out to play with their kids this much. 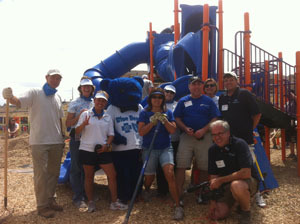 Adult confidence in their own ability to change the community increased 29% after the playground build. Neighborhood pride increased by 23%, and neighborhood trust increased by 48%. Photos from KaBOOM! and Blue Cross and Blue Shield playground builds in Tulsa, OK (upper left), Chicago, IL (upper right), Rio Rancho, NM (bottom left), and Marshall, TX (bottom right).